Top Nana’s After School Fruit & Yogurt Parfaits with Granola Crunch are made with a participating Box Top product! Hi Nanas. I’ve got something new on my mind. We all remember the PTA at our (now grownup) child’s elementary school, and since that stands for Parent Teacher Association and not Grandparent Teacher Association, I’m not here to advocate we join it. I just wanted to tell you about Box Tops for Education, and remind you that anyone can get involved; the registration is free—just have the zip code of your grandchild’s school handy and the site lets you set up a profile, play sweepstake games and keep track of the number of dollars you’re earning for education. Some schools generate thousands of dollars a year snipping Box Tops. That’s a lot of new books! But you don’t need a computer to get involved. Before I delve any further into this week’s topic, I want to get one thing off my chest. This is an interesting, if not challenging thing for Top Nana to write about because of the “fresh is best” mantra I staunchly live by. I pay attention to what the parents of grandchildren are doing, and what’s important to them, so when I talked with a thirty-something friend (and Nana Network Fan) about her son’s kindergarten experience and Box Tops came up, I was, admittedly, non too excited about Hamburger Helper and some of the “dinner kit” items on the participating products list. But then it hit me; this could be healthy, and this could be fun! After perusing the Box Tops foods list, I saw a lot of potential for building healthy family meals. Better yet, I saw an excuse to do my favorite thing on earth: stroll the Farmer’s Market! I planned on picking up enough fresh fruit and veggies to really “kick up” (Nana’s favorite term) two of the dishes I could make with Box Top products. 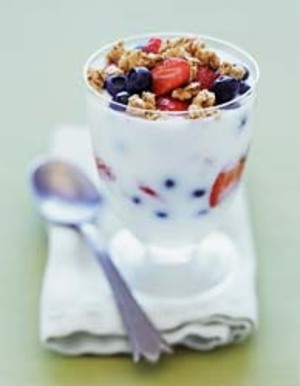 The first recipe After School Fruit & Yogurt Parfaits with Granola Crunch, showcased in this blog post make a wonderful low-fat, energy kick if your grandkids come by, peckish after school. Please note in the ingredient list for these Parfaits that the recipe calls for Yoplait yogurt, a big Box Tops for Education earner! The second thing I tested was the El Paso Dinner Kit, and, once I added my Farmer’s Market finds of enormous green bell peppers, onions and vine ripe tomatoes, (all of which I later sautéed as a topping before the casserole dish went into the oven), I have to say, it wasn’t half bad. In fact the green pepper and chicken strips melded together so beautifully and so well, I was ready to jump up and down that the entire dinner prep took only 20 minutes. It’s important to note that a lot of Box Top dinner kits leave you room for imagination and interpretation—a chance to “become one with the veggie” by literally thinking outside (of those cooking instructions) on the box and adding, say, fresh green peas and cracked pepper to the Tuna Helper or building a fresh fruit salad around a basket of Pillsbury rolls, both big participators in Box Tops for Education. Now, Nana’s Adventures in Babysitting can feature a brand new activity: cutting out Box Tops—you’d be surprised how much little people enjoy helping you find them on cereal boxes, etc. Next time you see your grandkids, get out the Yoplait and make them this tasty Parfait snack; it features fresh fruit, Yoplait and crunchy granola they can help sprinkle—serve it up in Nana’s Favorite thing this week: fun retro sundae glasses. Who knows, maybe they’ll learn what “retro” means in a book that your Box Tops help buy!